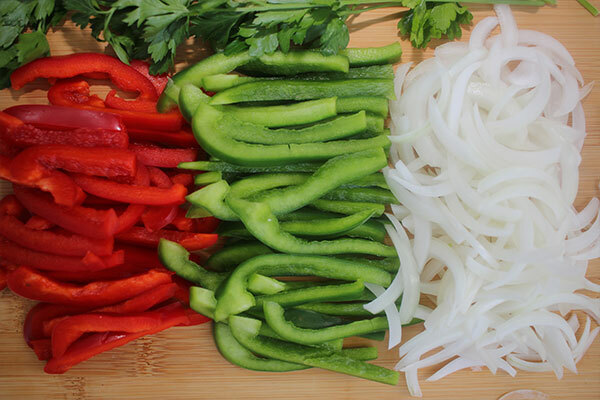 If you like fajitas, you’re going to love these. 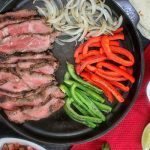 The seasoning is one that I have played around with for a long time and I find it provides just the right amount of sweet and heat to fajita beef. 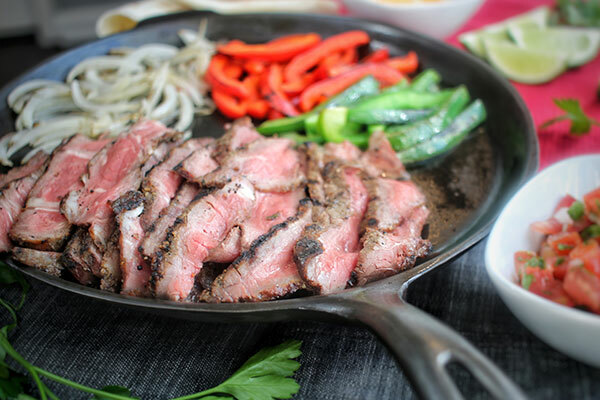 I use flat iron steak here, but you can use flank steak or flap steak as well. What’s also is great about this recipe is that you can easily make use of leftover steak and still turn out a great meal. Notice that I always use freshly shredded cheese. Don’t use the pre-packaged stuff. It’s coated with a wax that keeps the shreds from sticking together in the package, and it just doesn’t melt very well. 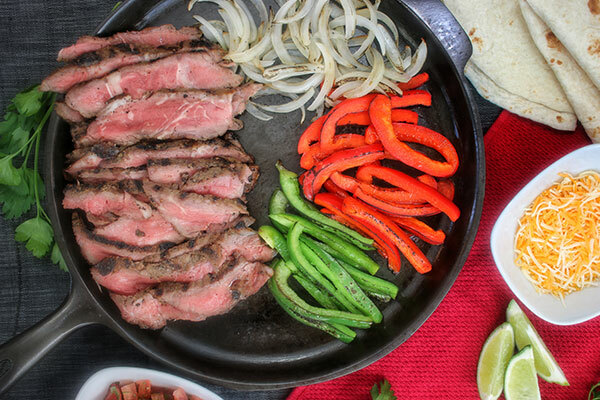 If you love fajitas, you should also check out my chicken fajita recipe in my upcoming book, Basic Training for Everyday Grilling. Serves: 4 | Prep time: 20 mins. | Cook time: 10 mins. Step 1: Light grill and set it for direct medium high heat. Step 2: Combine all seasoning ingredients in a bowl, mix well. Step 3: Coat steak on both sides with fajita seasoning. Step 4: Shred 1 cup of Monterey Jack cheese. Step 5: Thinly slice peppers and onions. Step 6: In a large mixing bowl, toss sliced vegetables with 2 tablespoons of olive oil and a pinch of salt. Ensure the vegetables are evenly coated with olive oil. Step 7: Place steak directly over medium high heat and grill for 3 minutes per side. Remove from grill and set aside. I cook the steak rare because when you put it on the griddle in step 10, it will continue to cook, getting to a nice medium temperature. Step 8: Place cast iron griddle on grill. When it is heated, add the vegetables and sauté them until they just start to soften, about 5-7 minutes. Step 9: Push vegetables to one side of griddle and remove from heat. Step 10: Slice steak and place on opposite side of hot griddle. 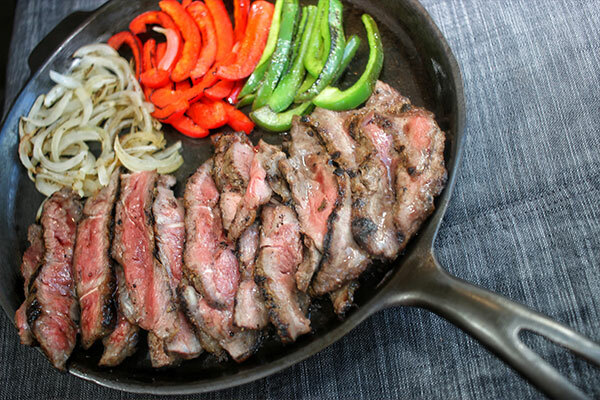 If you are using leftover steak, you can place it on the griddle cold and it will warm up quickly. Step 11: Serve with warmed tortillas, shredded cheese, sour cream, and pico de gallo. Light grill and set it for direct high heat. 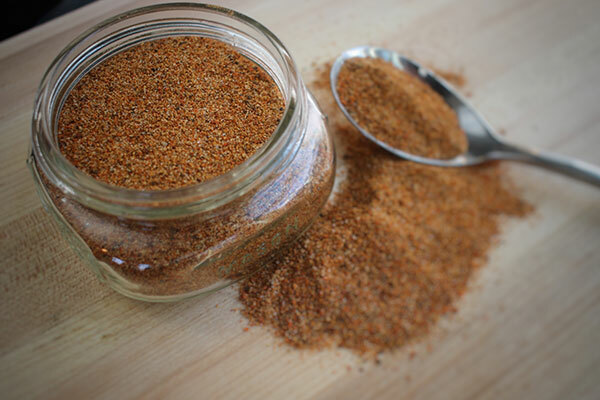 Combine all seasoning ingredients in a bowl, mix well. Coat steak on both sides with fajita seasoning. Shred 1 cup of Monterey Jack cheese, set aside. Thinly slice peppers and onions. In a large mixing bowl, toss sliced vegetables with 2 tablespoons of olive oil and a pinch of salt. 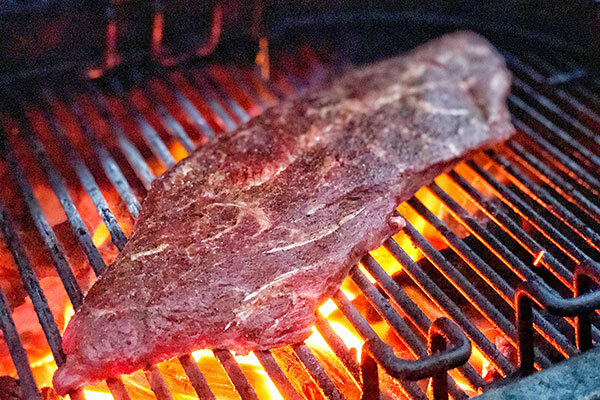 Place steak directly over medium high heat and grill for 3 minutes per side. Remove from grill and set aside. 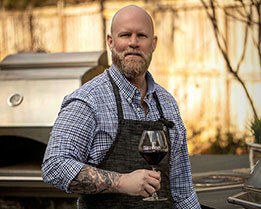 Place cast iron griddle on grill. When it is heated, add the vegetables and sauté until they just start to soften, about 5-7 minutes. Push vegetables to one side of griddle and remove from heat. Slice steak and place on opposite side of hot griddle. Serve with warmed tortillas, shredded cheese, sour cream, and pico de gallo.